NEW YORK, NY, October 24, 2016 — Marking the achievement of the first major step in Columbia University’s most transformational building project since it moved to its historic Morningside Heights campus in 1897, leaders of the University today dedicated the new Manhattanville campus, now taking shape along Broadway immediately above West 125th Street. At a ceremony that echoed the dedication program for the Morningside Heights campus more than a century ago, Columbia President Lee C. Bollinger was joined by distinguished faculty, University deans, and students in welcoming civic and community leaders and internationally renowned architect Renzo Piano of Renzo Piano Building Workshop, which designed the campus master plan with Skidmore, Owings & Merrill. Piano also designed the first buildings to rise on campus: the Jerome L. Greene Science Center, housing the Mortimer B. Zuckerman Mind Brain Behavior Institute, and the Lenfest Center for the Arts. Move-in will now begin, with full operation of the buildings and opening ceremonies planned for spring 2017. 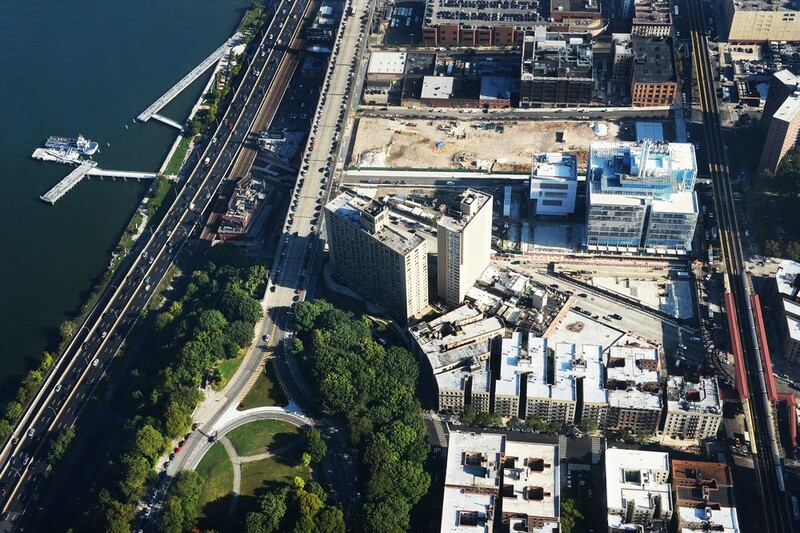 Establishing Columbia’s building footprint for the 21st century, the Manhattanville campus will be realized over the course of the next several decades in the former industrial area on the far west side between 125th Street and 133rd Street, with 6.8 million square feet of new academic space estimated to cost $6.3 billion. 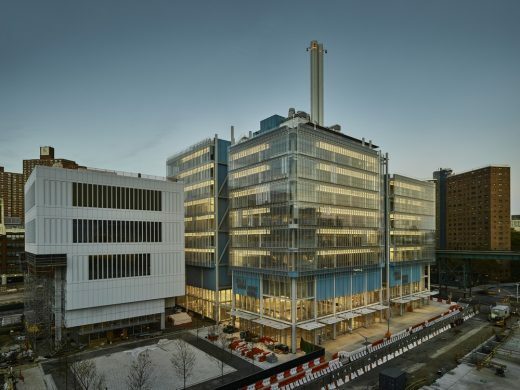 Reflecting the University’s values, this new urban campus is designed to have no barriers, either between academic disciplines or between Columbia and the West Harlem community. Academic facilities will be University-wide in impact, the amply landscaped grounds will be woven into the existing street grid with no walls or gates, and all buildings will be open to the public and programmed for community use at street level. 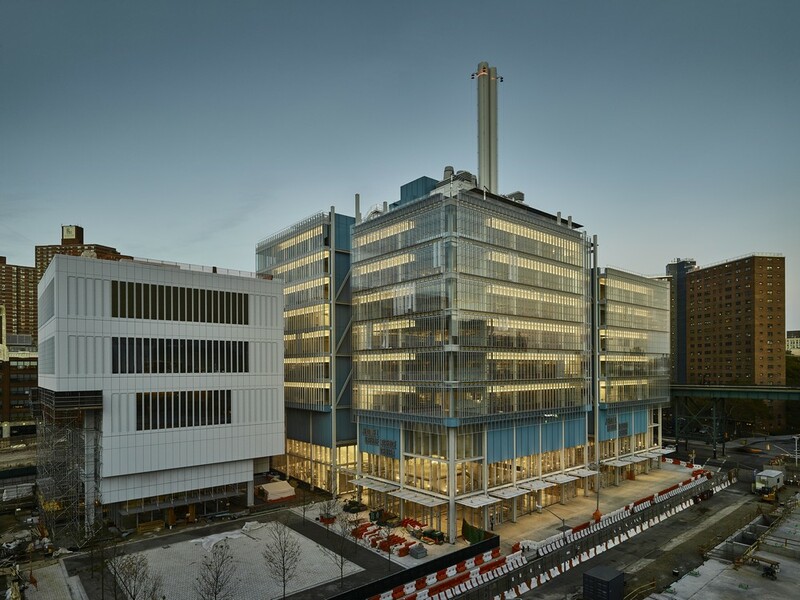 Receiving recognition and thanks were the major donors to the 450,000-square-foot Jerome L. Greene Science Center, the pioneering neuroscience research institute for which the building is designed, and the 60,000-square-foot Lenfest Center for the Arts. They are Christina McInerney, president and CEO of the Jerome L. Greene Foundation and daughter of the late Dawn M. Greene; philanthropists Mortimer B. Zuckerman and H.F. “Gerry” Lenfest, Founder of the Lenfest Foundation. 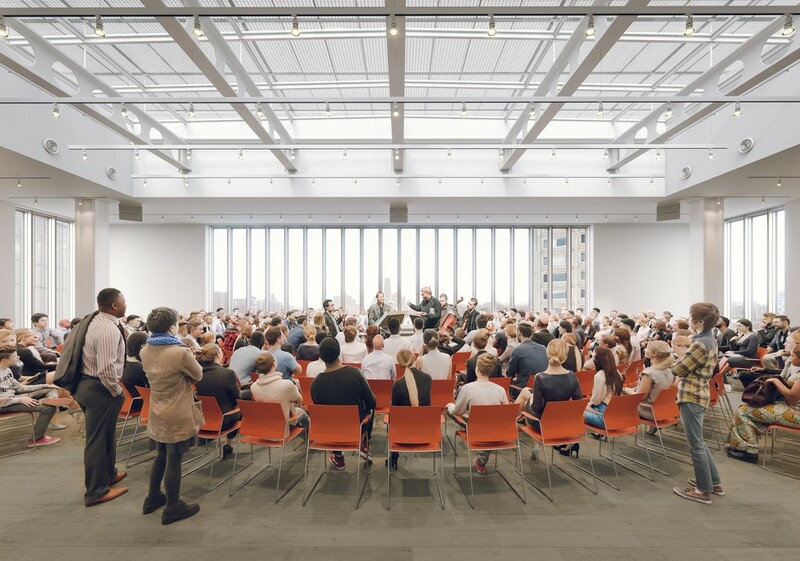 A third building on the Manhattanville campus, the 56,000-square-foot University Forum and Academic Conference Center, also designed by Renzo Piano Building Workshop, is currently under construction and is expected to open in 2018. Soon to begin construction is a new home for Columbia Business School, the Henry R. Kravis Building and Ronald O. Perelman Center for Business Innovation, designed by Diller Scofidio+Renfro in collaboration with FXFowle around a one-acre publicly accessible green space. Initiated in 2003, with New York City rezoning approval granted in 2007 and pre-construction site work begun in 2008, the Manhattanville campus project will be realized in stages. The initial stage incorporates the construction of the Jerome L. Greene Science Center and the Lenfest Center for the Arts (both with Davis Brody Bond as executive architect) and the University Forum and Academic Conference Center (with Dattner Architects as executive architect). 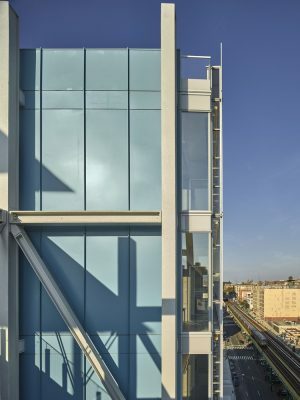 The skin of the first building is primarily glass, the façade of the second is primarily metal panel, and the third will be predominantly made of prefabricated concrete—a contrast of materials that serves the different functions of these initial buildings while establishing the architectural palette for the campus. To create what Renzo Piano calls an Urban Layer, all new buildings will be transparent at street level and open to the public, with many accommodating retail and restaurant tenants to engage the community and enliven the campus. Three early-20th Century industrial buildings in Manhattanville are becoming part of the campus through adaptive reuse: a former auto finishing plant for Studebaker Motors (now housing University administrative offices), the former Sheffield Farms dairy facility (now the School of the Arts’ Prentis Hall), and the Warren Nash Service Center. In addition, the master plan calls for widening and landscaping sidewalks throughout to create a walkable, accessible campus. The first open space to be completed on the new campus, the Small Square, is an informal, 10,000-square-foot outdoor plaza. Designed to engage the public and University community with seating areas and free Wi-Fi, the Small Square is suitable for passive use and a variety of performances and events. Lend Lease and McKissack Construction serve as the construction management firms for the Jerome L. Greene Science Center and Lenfest Center for the Arts. Skanska and the Velez Organization are the construction management firms for the University Forum. Turner Construction will be the construction manager for Columbia Business School. 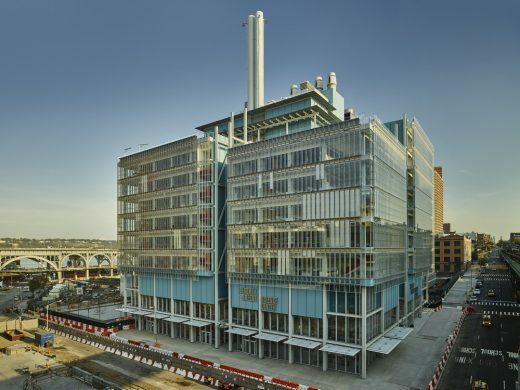 The largest building ever constructed by Columbia University, the Jerome L. Greene Science Center provides 450,000 square feet of space for the neuroscience researchers of the Zuckerman Institute: 110,000 square feet below grade and 340,000 square feet above ground on nine floors, including two outdoor terraces. 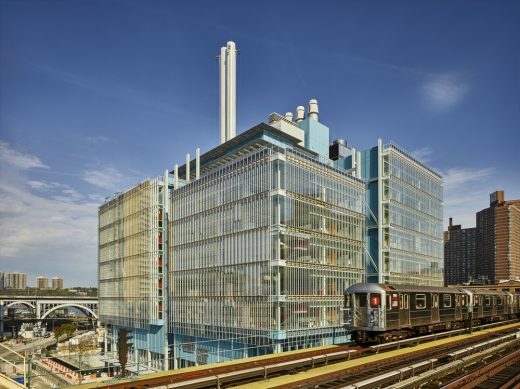 Charged by Columbia to create a place for “unexpected and fortuitous collaboration” (in the words of Zuckerman Institute Codirector Thomas Jessell), “fueling scientific discoveries that otherwise would never have the chance to flourish,” Renzo Piano Building Workshop has devised a radically open concept for the Jerome L. Greene Science Center. The design clusters meeting rooms around the core of the principal research levels (floors 3 through 9), ringing them with open-plan laboratory areas. 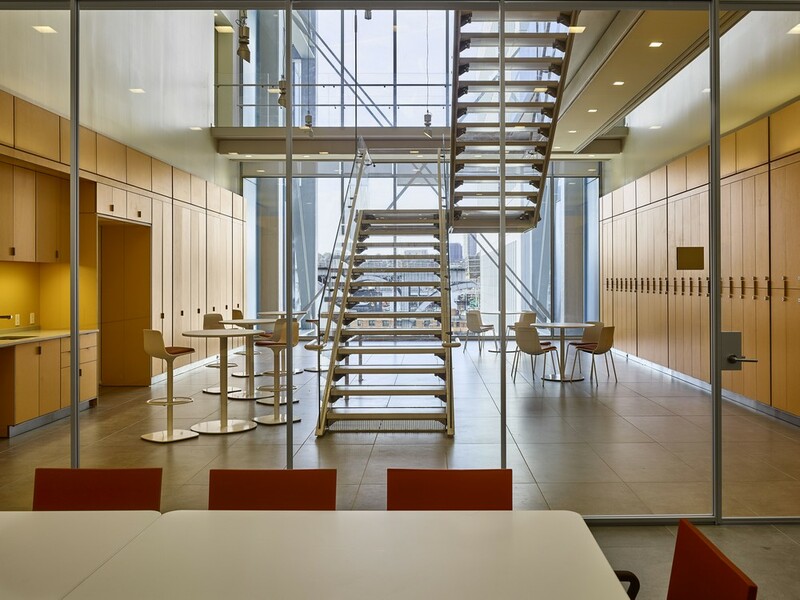 Interactive spaces (including kitchens and open staircases) occupy the corners of each floor. 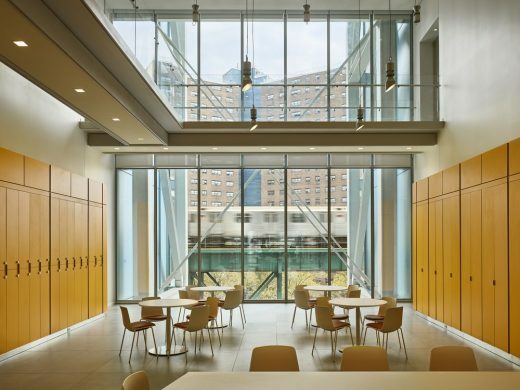 Natural light floods through the floor-to-ceiling windows of the building’s glass curtain wall, framing views of the campus and city and contributing a feeling of openness and interaction. 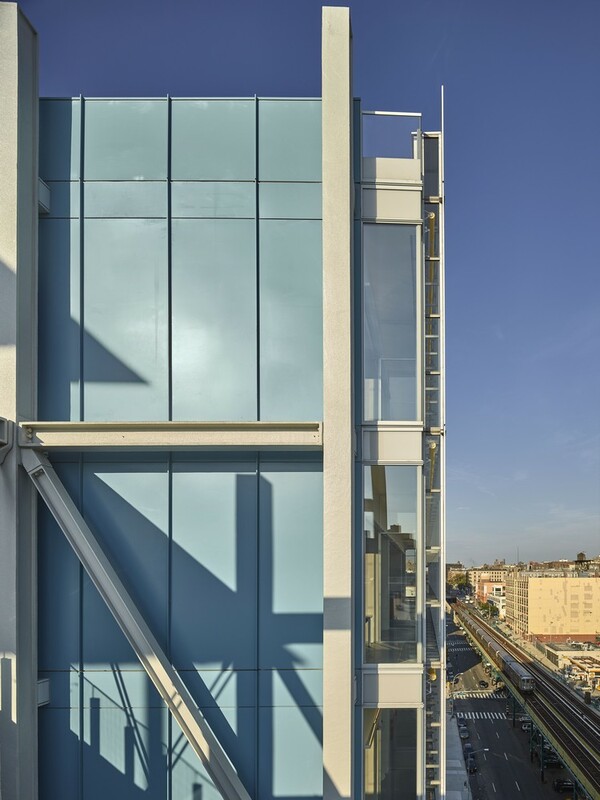 To shut out noise—an imperative for a research facility built immediately next to a busy truck route and elevated train—and to reduce heat gain, the curtain wall on the northeast and southeast sides is made of a double wall system, with air passing through a 16-inch cavity between the layers to help cool the building in summer and heat it in winter. Established in 2012, the Mortimer B. Zuckerman Mind Brain Behavior Institute is Columbia University’s comprehensive center for interdisciplinary and collaborative research in brain science. Led by a group of the world’s most distinguished neuroscientists, Columbia’s Zuckerman Institute will bring together approximately 800 researchers working in more than 50 labs, each with its own principal investigator, to pursue one of the most urgent and exciting challenges of our time: understanding the mind and brain. The team of neuroscientists, engineers, statisticians, psychologists and other scholars from across Columbia and its Medical Center study how the brain develops, performs, endures and recovers. Areas of research include learning and memory, movement, decision-making, growth and development, diseases and disorders, computation, the senses, emotion and the tools and technologies that make transformative discoveries in these fields possible. A deeper, more intricate knowledge of the brain will accelerate efforts to design effective treatments for brain-related disorders such as Alzheimer’s and Parkinson’s, as well as depression and autism. Greater insight into creativity, decision-making, perception and language will enrich and ultimately transform a range of endeavors, from computer science and the arts to economics, law and social policy. The Zuckerman Institute is led by founding Codirectors Richard Axel, MD, University Professor, Columbia University (Nobel Prize in Physiology or Medicine, 2004, with Linda B. Buck); Thomas M. Jessell, PhD (Kavli Prize winner, 2008), Claire Tow Professor of Motor Neuron Disorders in the Departments of Neuroscience and of Biochemistry and Molecular Biophysics, Columbia University; and Eric R. Kandel, MD, University Professor and Kavli Professor of Brain Science, Columbia University (Nobel Prize in Physiology or Medicine, 2000). In addition, the Small Square in front of the Lenfest Center can be used for a variety of outdoor performances. All four programs (screening room, performance space, Wallach Art Gallery and presentation space) are given double-height areas within the eight-floor building, with support services and offices located on the mezzanine levels. To underscore the Lenfest Center’s mission of serving both the University and the city, the façade at street level is a completely transparent custom-glazed curtain wall. The development of the streetscape through setbacks, sidewalk widening and landscaping and the provision of the Small Square immediately outside the Lenfest Center also promote a connection to the community and make for a more walkable city. Within the Lenfest Center, the architects have achieved large column-free spaces and ceiling heights of 17 feet and more by transferring vertical loads to large column-like structures that are visible from outside at the northwest and northeast sides of the building. 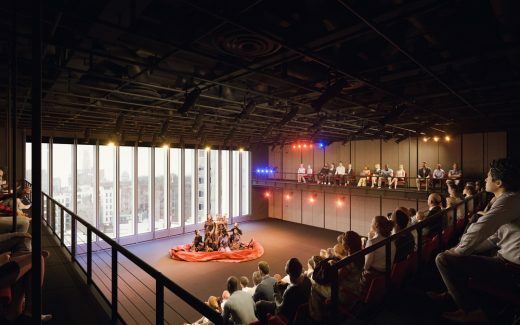 Above the ground floor, the façade is made principally of painted aluminum, with large expanses of double-height windows delineating the three program areas (performance space, Wallach Art Gallery and presentation space) that benefit from natural light. Each performance venue has its own dedicated audiovisual system, which can operate independently. These systems are in turn interconnected, enabling collaboration. In addition, audiovisual systems provide full integration with Columbia University’s IT campus infrastructure via both standard Internet and Internet 2. Among the first exhibits at the Lenfest Center to welcome the public will be Uptown, a summer 2017 survey of contemporary artists who live and work north of Manhattan’s 99th Street, organized by Deborah Cullen, director and chief curator of the Wallach Art Gallery. Other exhibitions at the Wallach Art Gallery during its first full year in the Lenfest Center will include Living in America: Frank Lloyd Wright, Harlem and Modern Housing, a collaboration with Columbia’s Avery Architectural and Fine Arts Library and The Museum of Modern Art, curated by Reinhold Martin, Professor of Architecture and Director of Columbia’s Temple Hoyne Buell Center for the Study of American Architecture; and Posing Modernity: The Black Muse from Manet and Matisse and Beyond, curated by Denise Murrell, Columbia University Art History PhD and Ford Foundation Postdoctoral Research Scholar. Established in 1965 and led by Dean Carol Becker, Columbia’s School of the Arts is a graduate professional school with a diverse community of committed artists from around the world and a faculty comprising acclaimed and internationally renowned visual artists, film, theater and television directors, writers of poetry, fiction and nonfiction, playwrights, producers, critics and scholars. 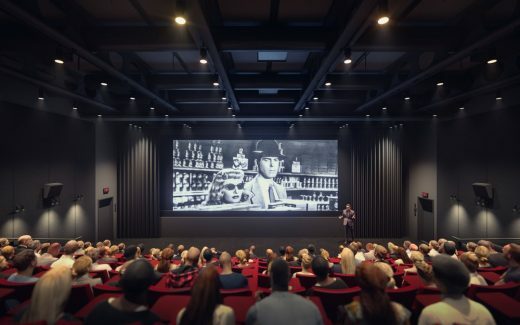 The School of the Arts offers degree programs in film, theater, visual arts, writing and sound arts and presents an ongoing schedule of public programs that will now have their first dedicated home at the Lenfest Center. Matching the construction method to the project’s goals, Columbia is working to develop the Manhattanville campus in a way that is both environmentally and socially sustainable. Two major agreements codify the University’s new investment to our local community: the Community Benefits Agreement, in partnership with the West Harlem Development Corporation, and the Declaration of Covenants and Restrictions with Empire State Development. Through these agreements, Columbia is investing more than $150 million in new benefits to its community. From August 1, 2008 through June 30, 2016, Columbia paid $132 million to minority-, women- and locally-owned (MWL) firms for non-specialty construction work, representing 34 percent of non-specialty construction spending (excluding construction management pay). From August 1, 2008 through June 30, 2016, the MWL construction workforce delivered 1.2 million hours worked for non-specialty construction work, representing 50 percent of the non-specialty workforce hours for the Manhattanville campus. Columbia has also aimed to set a new standard in clean and quiet construction practices: recycling more than 90 percent of construction debris; improving storm and wastewater sewers, so that overflow from the City’s wastewater treatment plant is estimated to be 1.6 million gallons a year less than it was when construction started; implementing exceptional noise and dust mitigation methods; and training community members in green construction skills. The U.S. Green Building Council recognized Columbia’s efforts in 2012 by awarding the Manhattanville campus project Stage 1 LEED Platinum certification under the LEED for Neighborhood Development rating system. 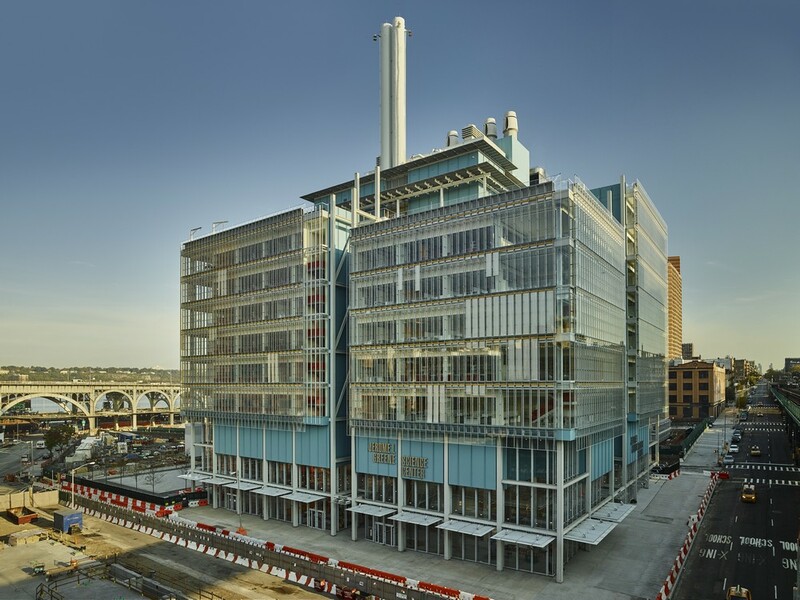 The rating is the highest designation, the first LEED-ND certification in New York City and the first Platinum certification for any university campus plan. The Manhattanville campus buildings are Columbia’s most recent investment in outstanding architecture, joining other recent structures including the Morningside Heights campus’ Northwest Corner Building by José Rafael Moneo, the Campbell Sports Center by Steven Holl at the Baker Athletics Complex in Inwood and the Washington Heights medical campus’ Roy and Diana Vagelos Education Center by Diller Scofidio + Renfro. The University Forum and Academic Conference Center designed by Renzo Piano Building Workshop is scheduled for completion in 2018. 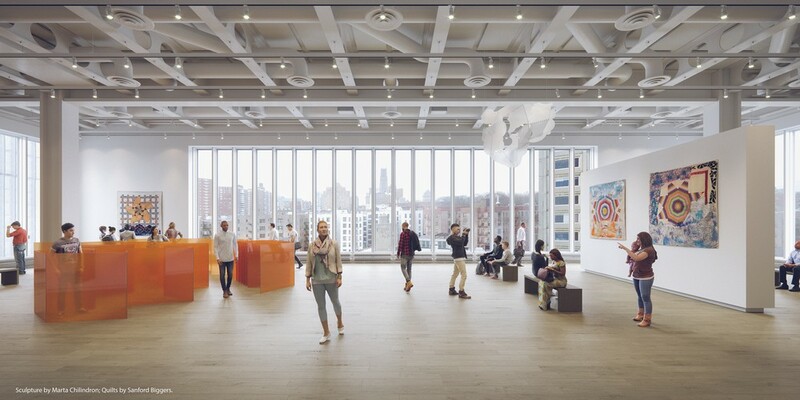 Construction is expected to begin on the Ronald O. Perelman Center for Business Innovation and the Henry B. Kravis Building designed by Diller Scofidio + Renfro in 2021. 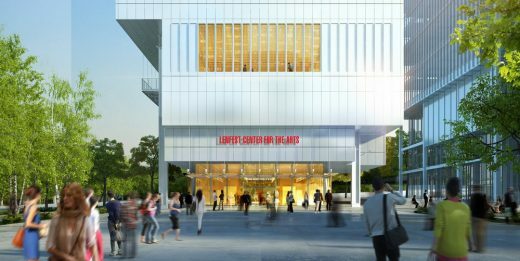 Columbia University will celebrate the openings of the Jerome L. Greene Science Center and the Lenfest Center for the Arts in the spring of 2017. 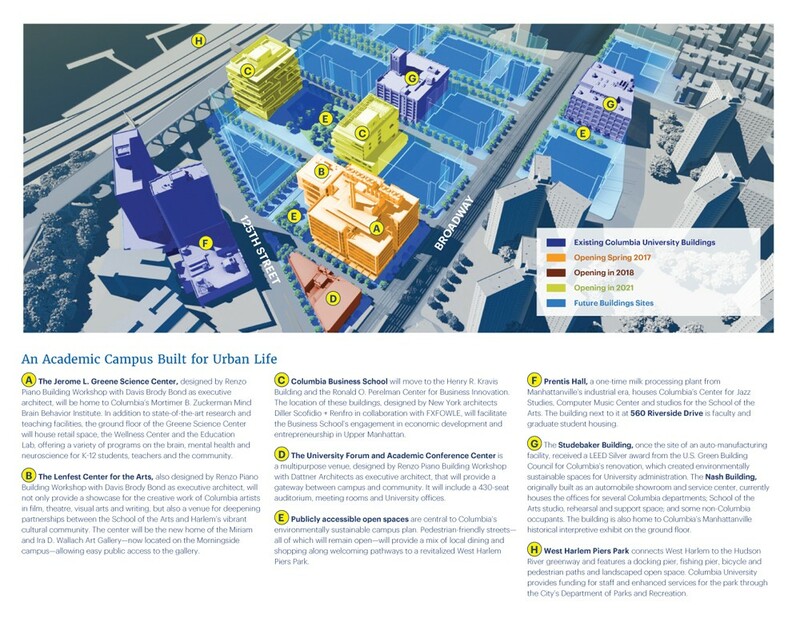 Master plan for the extension of Columbia University in the Harlem district, New York. A project where architecture meets city-planning and sociology, reinventing the role of campus and opening its doors to the city. The Columbia University campus has been located since 1896 on Morningside Heights, the hill next to Harlem. We are in the district that saw the birth of jazz and Martin Luther King’s social struggle, the Black Panther revolt and the films of Spike Lee.